BJP leader Subramanian Swamy today said Tamil Nadu Chief Minister Jayalalithaa should apologise to the Kanchi Mutt seers after a Puducherry court acquitted them of murder charges. Swamy visited the Mutt and received Swami Sri Jayendra Saraswati. In a huge relief to the pontiffs of the Mutt — Jayendra Saraswathi and Vijayendra Saraswathi — a Puducherry court on Wednesday acquitted them in the sensational case of murder of a temple official in Kancheepuram in Tamil Nadu in 2004. 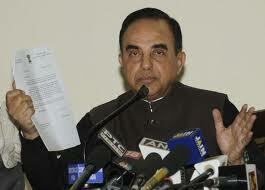 Swamy has consistently campaigned against Tamil Nadu government for allegedly foisting a false murder case against Acharyas. Later, he met both the senior and junior Shankaracharyas separately. Talking to reporters at the Mutt, he said Jayalalithaa should apologise to the Acharyas.